Soon after the launch of Vivo V9 smartphone, which is the premium device of the company, the specifications of the so-called Vivo V9 Youth have been leaked. 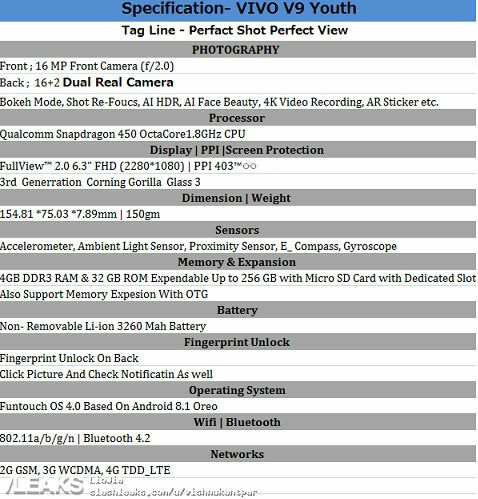 Slashleak has published the spec sheet of the alleged smartphone. Just like the V9, the V9 Yout is also a camera-centric smartphone equipped with artificial intelligence technology. From the specifications, we can say that it will be a lower version of Vivo V9 targeting the mid-range market. Talking about the hardware specs, the Vivo V9 Youth will feature a 6.3-inch FHD+ FullView display with a resolution of 2280 x 1080 pixels and protected by Corning Gorilla Glass 3. There will be a notch on the display, as we’ve witnessed in other smartphones like the iPhone X, OnePlus 6 and Oppo R15. A Qualcomm Snapdragon 450 will be powering the handset clocked at 1.8GHz as compared to the V9‘s Snapdragon 626. There will be 4GB of RAM and 32GB of internal storage, which is further expandable up to 256GB via microSD card. Now coming to the camera which is the main highlight of the smartphone. There is a dual camera setup of 16-megapixels at the rear equipped with features like Bokeh Mode, Shot Re-Focus, AI HDR, AI Face Beauty, 4K Video Recording, AR Sticker, etc. On the front, there is said to have a single 16-megapixel sensor for selfie lovers. Other specifications that might come in the phone include a 3260mAh battery, Android 8.1 Oreo and a fingerprint reader at the rear. Next articleReview of Vivo V9: Is it Worth Buying?